Norwegian is spoken by 5 million speakers in mainly in Norway. There are also some speakers of Norwegian in Denmark, Sweden, Germany, the UK, Spain, Canada and the USA. 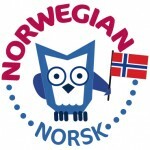 Nowadays, the majority of Norwegians use the written dialects Bokmål (literally, “book language”, which was renamed from Riksmål) and the rest use Nynorsk (literal meaning, “New Norwegian”, derived from Landsmål). Bokmål is closer to Danish while Nynorsk uses Norwegian-based words and reflects dialectical differences. Watch out for the range of products that are coming will help you on the road to teaching your child Norwegian.